Project: Feasibility study of an existing site on the Folsom maintenance yard facility to plan for the future expansion of a 50,000 ton salt storage building. 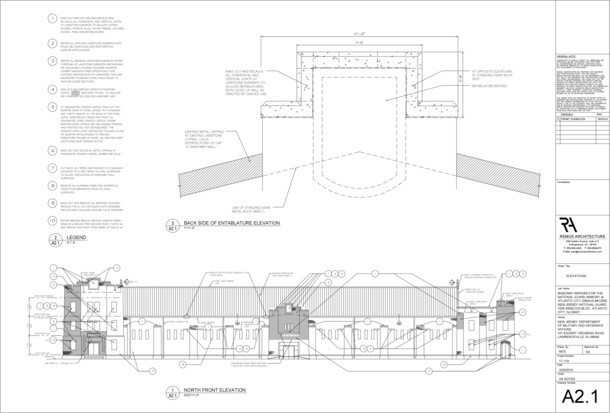 New building size is 132’ wide by 446’ long by 69’ high 1 story, 59,021 sf. gross, fabric structure, with drive through capabilities so that salt trucks can be loaded under cover. Project: Develop a master plan that includes circulation with existing building, new storage building, conversion of existing building into showroom with office, and parking area. Project: A complete new reroofing project for the Atlantic City Municipal Utilities building consisting of two layers of insulation with a fleece back 80mil. TPO roof membrane. 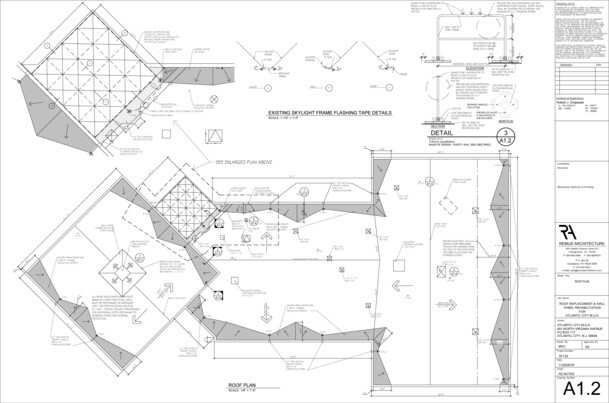 Project: The summary of work for this historical restoration project is sectionalized removal of existing EPDM wall flashings to uncover and/or reactivate underlying through-wall flashing installations. Repair all broken or cracked limestone elements. Saw-cut and rake out defective mortar joints. Remove all loose and/or flaking lead paint at designated exterior wood cornices then provide one coat exterior grade primer and two coats exterior grade paint over all cornice surfaces and profiles. Project : New construction storage facility to be managed by CubeSmart Self Storage. The building is 3 stories, 126,000 sq. ft. gross, 96,000 sq. ft. net rentable, climate-controlled, with two elevators and a built in office area. 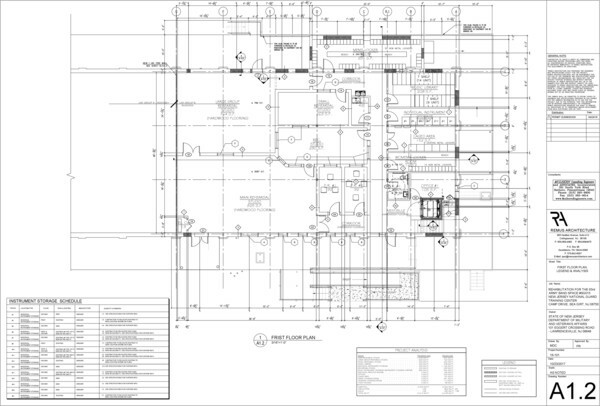 Remus Architecture provided programing, schematic design, design development, construction documentation and construction administration services. New Office Building Facility - Menands, N.Y.
Project: The Harmony Prima Lofts Office Building designed by Remus Architecture serves a two story office building facility for the security staff, office staff and storage staff to operate the overall campus of apartments and storage. 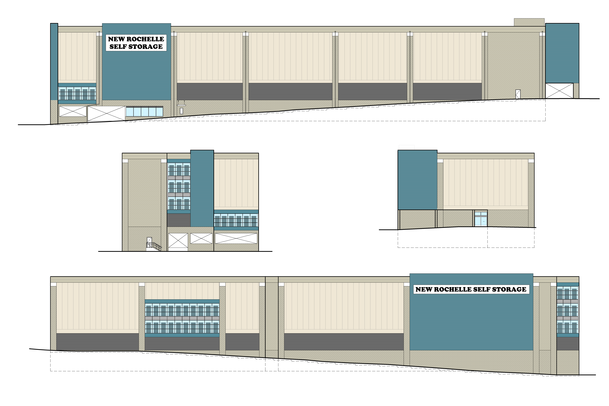 Project: New construction storage facility to be managed by ExtraSpace Storage. The building is 5 stories, 152,000 sq. ft. gross, 121,000 sq. ft. net rentable, climate-controlled, and built in office area with 2 elevator lobbies containing 2 elevators at each entrance. Remus Architecture provided programing, schematic design, design development, construction documentation and construction administration services. Project:New construction storage facility to be managed by Devon Self Storage. The building is 3 stories, 42,000 sq. ft. gross, 31,000 sq. ft. net rentable, climate-controlled, and built in office area with an elevator lobby containing 2 elevators at the main entrance. Remus Architecture provided programing, schematic design, design development, construction documentation and construction administration services.